It is almost that time of year when we escape our daily lives, and head out for a little bit of sunshine and R&R. Most people will want to bring along their beloved BlackBerry. The problem is, you can rack up quite a bill using your BlackBerry in another country. Data charges from carriers other than your own can be ridiculous, and certainly not a pleasant way to end your vacation. First of all, while on the plane you can not have an active mobile connection. Some phones have an "airplane" mode, a BlackBerry does not. 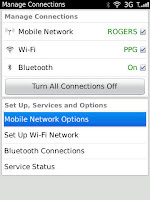 Simply click the Manage Connections icon, and uncheck the Mobile Network box. When you arrive at your destination, just recheck that box. Don't forget that your BlackBerry can entertain you on the plane! Upload music, movies or download a couple of free games from App World before you leave. What I recommend for travelers, is unless you HAVE to receive emails/BBM/Twitter/FB while on vacation, set your data to off while roaming. This will allow you to receive calls, but will not use data from the foreign carrier you're connected to. 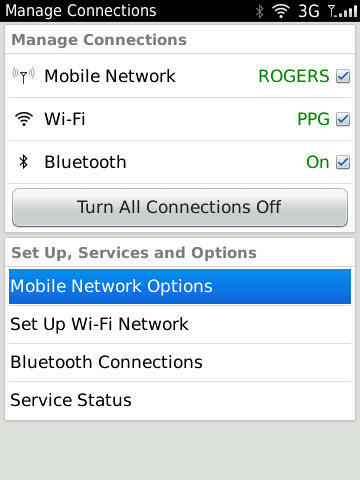 To do this, click the Manage Connections icon, and then click the Mobile network options. In here you will find a drop down box with the options for data. 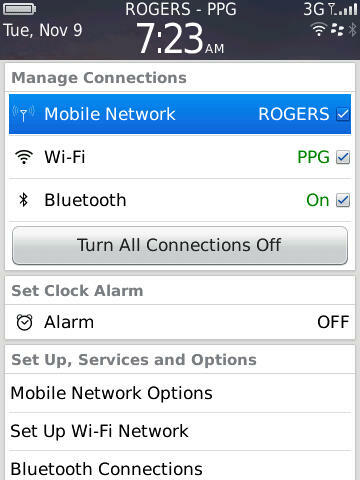 The options will vary from OS to OS (depending on BlackBerry model) but the option you want is "OFF while roaming". This settings tells your BlackBerry to only use data when connected to your carrier (in your home country). I would also recommend contacting your service provider PRIOR to departing, to discuss any special plans you can purchase to keep your mobile traveling costs low. Some providers offer small packages that allow texting, and phone calls at a lower rate than what you would pay normally abroad.